Covet is part retail space, part design studio. Covet is a new kid on the Arguello block in San Francisco. 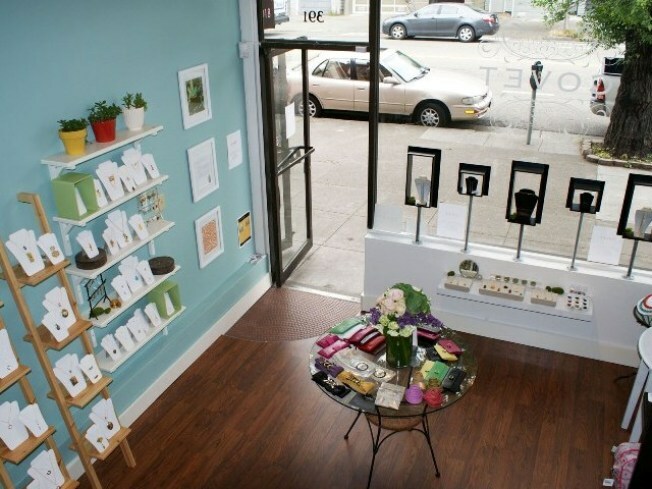 The little boutique, born in May 2009, boasts jewelry from the collaboration of two local jewelry designers Adrienne Wiley and Liza Anongchanya. What’s brilliant about Covet is that it is a split level loft, serving as an in-house design studio and retail space. It oozes a creative, peaceful vibe with Azure blue and Grass green colors with butterfly shapes dancing on the walls. In addition to shopping in the boutique, the designers offer private shopping parties. The most popular party is called a Sip-n-Shop where you will find a Bellini Bar and Cupcakes for 10 girlfriends. Trunk shows will often grace the Covet space too – bringing in other designers (jewelry, handbags, accessories) for their adoring fans. And…guys, listen up, there is a Wish List made for you. Ask your lady to pop over and fill out which pieces she likes and you are no longer lost for gift ideas! Adrienne Wiley is the Founder of Frolick Jewelry. Vintage-inspired, colorful baubles that have a trendy edge. Her designs are inspired by unusual charms that she creates fun clusters with. Ranging from fish, birds, butterflies, feathers, and even lucky charms. Not only are there a wide variety of animals, you’ll find semi-precious stones and filigree. Wiley designs necklaces, earrings, bracelets and rings. Liza Anongchanya is the Founder of Ofina Jewelry. She creates sterling silver and 14k gold pieces that are simple, delicate and geometric. Circle, squares, mixed metals and some simple stones like tourmaline and aquamarine are the preferred medium for Anongchanya. We also find playful single trinkets on a lariat: a pair of scissor, a lone keys, a single gun and even handcuffs. Anongchanya designs earrings, lariats, and necklaces. Both designers offer Bridal wear and custom pieces. Big Bonus: Adrienne and Liza are always there – contact with the designers for one-of-a-kind pieces is a delight. Corinne Phipps is the creator of Urban Darling, a wardrobe styling and closet auditing company.